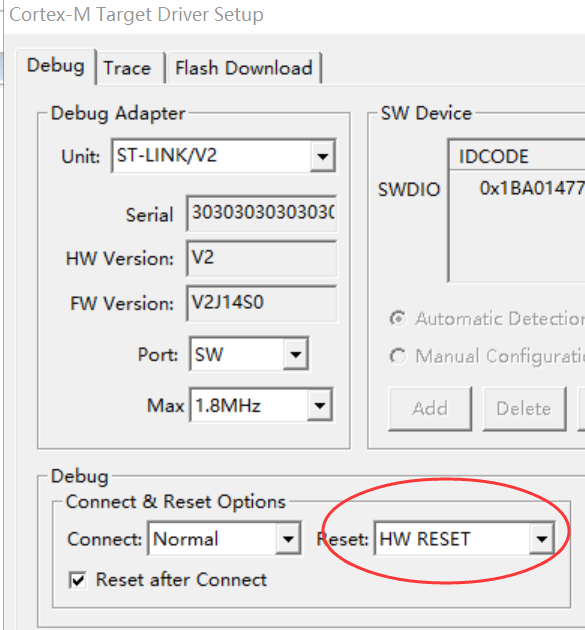 Reset — HW RESET performs a hardware reset by asserting the hardware reset (HW RESET) signal. Reset — SYSRESETREQ performs a software reset by setting the SYSRESETREQ bit. The Cortex-M core and on-chip peripherals are reset. Reset — VECTRESET performs a software reset by setting the VECTRESET bit. Only the Cortex-M core is reset. The on-chip peripherals are not affected. For some Cortex-M devices, VECTRESET is the only way to reset the core. VECTRESET is not supported on Cortex-M0 and Cortex-M1 cores. Reset — Autodetect selects one of the above reset methods based on the target device. The SYSRESETREQ method is used if an unknown device is detected.